Jack McLean scored Bexhill United's second goal and was an influential figure in the 3-1 win against Steyning Town. Bexhill United Football Club went past its points total for the whole of last season after winning 3-1 at home to Steyning Town on Saturday. 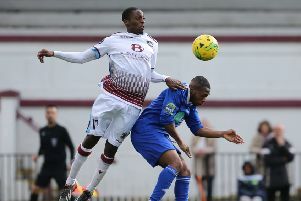 The Pirates, who still have seven Macron Store Southern Combination League Division One matches remaining this term, got back to winning ways after successive home losses. On a glorious afternoon at The Polegrove, Bexhill made a fantastic start and two goals in quick succession around the 15-minute mark put them in charge. The opener was another Craig Ottley penalty after Connor Robertson burst forward from right-back and went past a couple of opponents until being brought down by the Steyning goalkeeper in the corner of the box. Soon afterwards, the ball was switched across to Jack McLean, who beat his man and rifled home a shot which flew past the goalkeeper. McLean was causing Steyning lots of problems and even before the goals he’d had a shot saved by the goalkeeper’s legs before Zack McEniry’s follow-up rolled against the inside of the post. Steyning came into the game during the final 25 minutes of the first half as play became more even, but Bexhill reached the break with their two-goal advantage still in tact. With midfielder Nathan Lopez driving them on, Bexhill started the second period very well against a Steyning side which came from two-down to beat them in September’s reverse fixture. Although McEniry missed the target from McLean’s cross to the far post, the third goal arrived soon afterwards. A cross from the right evaded everybody and Corey Wheeler had a simple header at the far post. Bexhill seemed to have the points in the bag, but the game suddenly changed. Steyning pulled one back when Alexander Townley timed his run perfectly to go clear on the left before cutting in and finishing neatly as Bexhill tried to get back. Steyning really came to life and Bexhill were all at sea for the next 10 or 15 minutes. Steyning were getting in behind Bexhill from their big centre-forward’s flick-ons and Bexhill were struggling to clear their defensive lines. Another Steyning goal would have set up a very nervy finish, but Bexhill goalkeeper Dan Rose collected balls into the box very well and eventually Bexhill managed to slow the game down and see it out fairly comfortably in the end. Kenny Butchers marked his return to the club from Langney Wanderers by coming on as a second half substitute. Bexhill: Rose; Robertson, McGuigan, McFarlane, Ottley; McLean, Holden, Lopez (Harffey), Wheeler (Butchers); Cuddington, McEniry (Giles). Sub not used: Rea.